Technology is advancing at rapid paces and we have to make sure that it remains safe to use. There are many appliances out there that employ potentially dangerous things like UV lights. Some air purifiers use UV lights to eliminate harmful particles in the air. With this technology, are air purifiers with UV lights safe? This article will tell you everything you need to know about using a UV air purifier safely. There is some cause for concern. Ultraviolet light can be dangerous, but luckily, these UV air purifiers are completely safe. You don’t need any special equipment to run a UV air purifier and they can help with your allergies. Some of these appliances are even combined with other filters, like carbon and HEPA filters. So, you might wonder how UV air purifiers are dangerous and what makes them safe. To understand the potential dangers of a UV air purifier, you have to know what UV is. UV stands for ultraviolet. 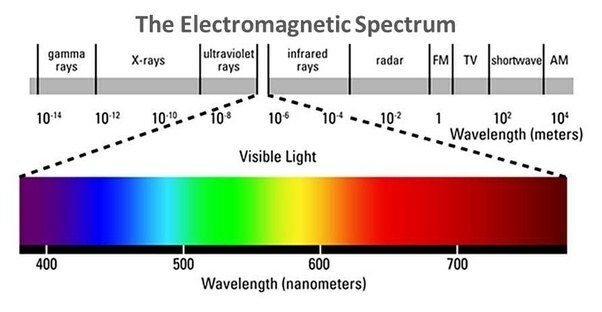 There is light in a spectrum that we can’t see. In addition to the visible spectrum of light wavelengths, there are ones that are even smaller and invisible to our eye. These rays of light can also be dangerous to us. The most UV light we can get is outside in the sun. Sunlight has ultraviolet light and is what causes sunburn on our skin. There are other rays of “light” you may know of are things like x-ray and gamma rays. These are very toxic to humans, especially the former, but x-rays are beneficial in the medical world to show bone structure in us. This is a good example of dangerous light being used for our benefits. Many safety steps must be used when having an x-ray done, but it is one of the best ways to treat fractures. Similarly, we have harnessed the ability to use UV light in order to assist in our health. Ultraviolet light, specifically UV-C light, is a germicidal light. That means it kills bacteria and viruses whenever they come into contact with it. While UV light can harm our own cells, scientists have made ways of using it in air purification methods. Now, UV air purifiers work well in reducing harmful particles in the air. What makes UV air purification safe? Whenever looking for an air purifier, there are many factors that you should consider in the first place. Many UV air purifiers are safe, but some produce ozone. This can be worrisome, considering high amounts of ozone is harmful to humans, animals, and plants. The fact of the matter is that ozone is fine in smaller quantities. Ozone is all around us, but if you’re worried, there are UV air purifiers that boast being “ozone-free”. The UV light in many air purifiers will incinerate and destroy particles on contact or in the vicinity of it. Some manufacturers coat their bulbs in a special substance that keeps it from producing too much ozone. The air purifiers are surrounded by dark metal or plastic, keeping the UV light from getting out into the open, so you don’t have to worry about any sort of radiation. There are many types of air purifiers. However, there are also many brands of certain air purifiers, especially UV air purifiers. Unfortunately, you have to be careful because some do produce large amounts of ozone. Staying away from these is a good idea, so pay attention to the reviews and other things that can hint at a good brand. What should you look for in a safe UV air purifier? As said above, there are a few factors you should consider whenever you purchase an air purifier. Different factors make for different pros and cons of air purifiers. Whenever you look for a UV air purifier, you have to consider where you’re going to put it. If you’re going to use it in one room, a relatively small one would be fine. However, if you want to do multiple rooms or a large living room or kitchen, you’ll have to get a bigger air purifier. The more surface area you need to cover, the bigger the UV air purifier you’ll need. While UV air purifiers are fine on their own, you should consider getting one with additional filters. 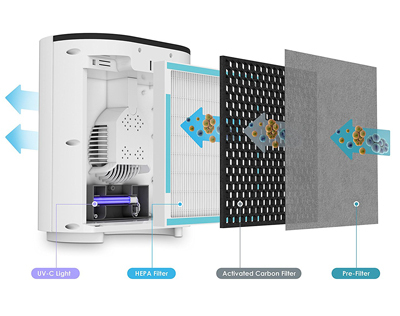 Some great air purifiers come with multiple filters, being a 3-in-1 or even up to a 5-in-1. While more doesn’t necessarily mean better, that does mean you’ll have to replace filters more often. With a UV air purifier alone, you simply have to change the bulb every one to two years. With UV air purifiers being a relatively new technology, you may have to consider getting a more expensive one. There are cheap versions out there, but you will have to worry about ozone production and even UV radiation leaking out. With many of the high-tiered air purifiers, you won’t have to worry about these things at all. You get what you pay for, so be sure to get something that will last a long time and keep you healthy. UV air purifiers are newer on the market, but it is being developed at a rapid pace. It uses short ultraviolet wavelengths to kill microbes like bacteria, viruses, and allergens. Things like pollen and pet dander are eliminated, thanks to the UV bulb inside the UV air purifier. UV air purifiers even work on mold spores that might be in a mold-infested home. It is a great tool to use for improving your health by cleaning the air around you. There is some concern with UV air purifiers producing ozone, but many of them do not. Depending on the amount of money you spend on it, you shouldn’t have to worry too much about it. Be sure to pay attention to customer reviews and those that have experience with them. As said above, you get what you pay for, so don’t skimp out on your health!